Resplendent Cherubfish (C. resplendens x C. argi) larvae were raised from captive-spawned eggs at 77-79F on wild copepods and artemia. First record of Resplendent Cherubfish culture. Following the breeding success of the popular Hawaiian Resplendent Pygmy Angelfish (C. resplendens x C. fisheri), the work on Centropyge hybridization continues with the captive-breeding of the Resplendent Cherubfish. The parents of this unique fish are arguable considered the two most attractive and distinctive pygmy angels species in the Xiphypops subgenus (also known as the “argi” or “fisheri” complex): the Resplendent Pygmy Angelfish (C. resplendens) from Ascension Island and the Cherubfish (C. argi) from the Caribbean. Left: Resplendent Angelfish male and Cherubfish female (parents). Right: Resplendent Cherubfish juvenile, 200 dph. Centropyge hybrids sometimes occur naturally between species that share the same geographic location. The natural distribution of the Resplendent Angelfish and the Cherubfish is separated by over 3,000 miles, which makes the Resplendent Cherubfish truly unique and only available through captive-breeding efforts. 200 day old Resplendent Cherubfish measure about two inches in length. 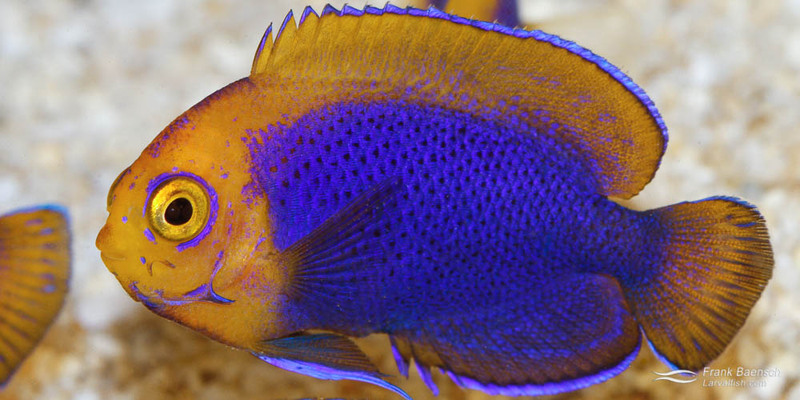 They have orange, yellow, purple and metallic blue; displaying a mix of the colors from their parents. They feed on spectrum 0.5-1.0 mm pellets (growth formula), a homemade frozen gelatin formula food and diatomacious algae growing on tank walls. Their demeanor appears less aggressive than what is common for dwarf pygmy angelfish species (Xiphypops subgenus).